Day 1: We arrived at 5am and headed to the historic district of Casco Viejo to find a hostel and get some more sleep before heading out to explore the city. We ended up at Hotel Casco Antiguo, which happens to be the oldest hotel in Panama City. It is currently being restored, but it is a beautiful old building with gorgeous tiles lining the walls of the foyer. This hotel actually used to be the resting place of the the Panama Canal workers. After waking up from hours of much needed sleep, we headed over to the famous Café Coca Cola for a café con leche and some food. An old guy staying at our hotel told us that this Café has been opened since 1875 and that Fidel Castro and Che Guevara used to meet here while planning the Cuban Revolution. For later in the night, we made reservations to see the play “The God of Carnage” at one of the theaters in town. Before seeing the show, we went to the banking district, Congrejal, to have a bite to eat before heading to the show. After dinner we asked multiple people and cab drivers how to get to the theater and nobody knew, so we took the next best option and headed to the local mall to shop around and catch the new Wall Street that just came out. Day 2: We started our day with another delicious meal at Café Coca Cola. As you’ll see, this is a very common theme of our stay in the city. There are three islands off the coast that are all connected to the mainland by the Causeway that runs between the three. Midday we strapped on our running shoes and caught a cab over to the entrance of the Causeway. We ran from the start all the way out to the beginning of the second island. Views of the city are amazing from this stretch of road and it’s a cool feeling to have water splashing on either side of the road. After our run, we showered up and walked around our neighborhood and found a nice spot for a bucket of beers, pizza and a salad. Day 3: After sleeping late and missing our hotel’s free breakfast AGAIN, we hit up our favorite breakfast spot, Coca Cola, for the 3rd time in 3 days. Afterwards, we went downtown to walk around in the midst of all the giant buildings. Panama City is under extreme development right now. I’ve never seen a city with so many new buildings going up. We wandered around for hours stopping at the town’s popular sushi chain, a grocery store, a pharmacy, a mall for a watch battery and Niko’s for a cappuccino. It was finally time to see the Canal, so we waved down a taxi and were on our way! We went to the Miraflores Locks and got to see 3 ships pass through the locks. It’s really an amazing sight to see how huge the boats are and what an incredible system has been developed here. We watched a movie that told about the plans to increase the size of the canal by building a third set of locks and found out that just last month the one millionth boat made it through the Canal. We were surprised by the fact that boats pay up to $240,000 to pass through the Canal! To celebrate our day, we decided to go to Calle Uruguay for dinner and drinks. This strip is compared to South Beach in Miami for the number of restaurants and bars that it has to offer. 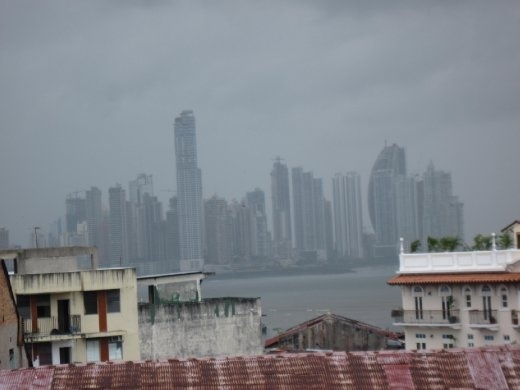 Panama City itself is sometimes known as the Miami of the South, except that more English is spoken here... Lol. Being a weeknight the strip wasn’t too crazy, but we got some good seafood and afterwards headed to a Middle Eastern style bar, Habibi’s, for mango hookah and a pitcher of sangria. Day 4: This is the day that we realized how hot and humid it is in Panama City! After breakfast, we walked out to Balboa Avenue that is the strip of the highway that connects Casco Viejo to the current downtown Panama. There are biking/jogging paths right in between this road and the water. In the evening there are lots of people that exercise here, but the keyword is evening! At noon, we were the only two people out running in the blazing sun and 90% humidity. 24 minutes later we decided that there was a reason we were the only ones out running and slowed our pace for our walk back to the hotel. Reading through the Lonely Planet, I found a spot that puts on traditional Panamanian folk dancing shows three times a week. After a little persuading, I got Brett to agree to go. The place is called Restaurante-Bar Tinajas and it has a large room set up with dining tables where you can have dinner and drinks while watching the show. Even on a Tuesday night, the place was filled to the brim and had a very festive atmosphere. The dancers had beautiful costumes, even dragon masks during one part, and put on a great show. Day 5: After the run on Balboa Avenue the day before, Brett and I decided to check the gyms the city had to offer. First place we stopped at wanted to charge $20 dollars per person to let us work out. This was obviously out of the question, seeing how we don’t pay this much back at home for one month! Before giving up, we went to one other gym. Brett came up with a story about how we had just moved to Panama City and were trying out different gyms in the area, hoping they’d let us try it out for free. It worked! We got a tour of the gym and a free trial! In the afternoon we took a walk around the entire Casco Viejo neighborhood. The president lives in this neighborhood so we went to see his house and even got a glimpse of him in the entry way! This area is located on a peninsula, so from the very tip you can the city’s skyline to one side and the Causeway and boats leaving the Canal to the other. The neighborhood is filled with the colonial style buildings and the area is undergoing extensive rehabilitation, so right next to a crumbling apartment building you’ll find a completely restored mansion. An odd mix, but this area definitely has huge potential! We closed out the night with Robert Rodriguez’s new flick “Machete.” Although it was slightly disturbing at times, but a great movie and I highly recommend it. The fact that the majority of it was filmed in Austin, TX made me very homesick. It is cool that this is his second movie in a row to be filmed in Austin, though! Our last day: Once again we’ve started our day at Café Coca Cola. Haha… We have plans to check out the Contemporary Art museum and tonight we’re going to make another attempt at seeing “The God of Carnage.” It will probably help that we have directions this time! Early tomorrow morning we are taking the train over to the Caribbean coast where we will catch our sailboat for Cartagena, Colombia. We have been looking forward to this sailboat ride since the beginning of our trip, so we are getting very excited! Thanks for reading! I miss all of you very much and hope everyone is doing well. I LOVE IT!! you guys are rockstars!! Just stay safe and continue to listen to your intuition! Sending LOVE, LOVE LOVE to you! Thank you for this! I'm thinking about going to Panama City for five days in August and I was afraid that might be too much time there, as all of the itineraries I've seen suggest only three to four days. It sounds like there was enough to see though and I want to relax, so I think it might be a good amount.